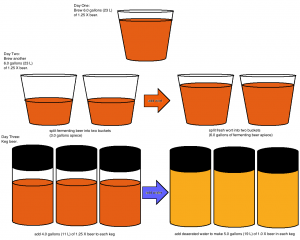 On Wednesday, I posted a method describing how to make 15 gallons (57 L) of beer (relatively) quickly, with a basic a 5.0-gallon (19-L) brewing setup. The idea was that you could make 15 gallons (57 L) of beer — something that would normally take three brew days at the 5.0-gallon (19-L) scale — in two brew days. If you were brewing for a party, but your brewing equipment was limited to the 5.0-gallon (19-L) ballpark, this could be just the thing. The biggest key to success is running a good fermentation. Be sure to pitch enough yeast the first day to get the wort fermenting by the time the second batch of wort is made. Additionally, watch the fermentation temperature so it doesn’t spike when the fresh wort from second batch wort is added to the already fermenting wort from the first batch. Make the yeast starter 2–3 days ahead of time. On brewday, heat 13 qts. 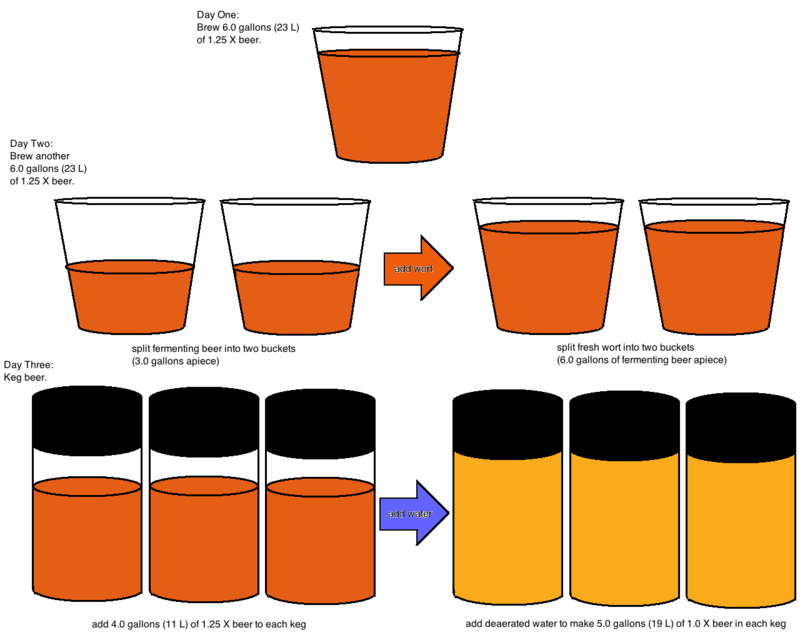 (12 L) of brewing liquor to 164 °F (73 °C) and mash grains, at 153 °F (67 °C), for 45–60 minutes. Stir the mash a couple times if you can do so and maintain temperature (via heating mash tun or adding hot water). Mash out to 168 °F (76 °C). Recirculate wort until clear, then run off. Sparge steadily over 75–90 minutes to collect about 8.5 gallons (32 L) of wort. Vigorously boil wort for 90 minutes, to yield post-boil volume around 6.25 gallons (24 L). Add hops, Irish moss, molasses and yeast nutrients at times indicated. Chill wort, then rack to a sanitized bucket fermenter. Your yield should be about 6.0 gallons (23 L). Aerate wort thoroughly and pitch sediment from yeast starter. Ferment at 68 °F (20 °C). The next day, stir fermenting wort with a sanitized spoon and pour half of it into a second sanitized bucket fermenter. You will have two fermenters, each with 3.0 gallons (11 L), at this point. Try to get roughly the same amount of trub in each fermenter (but don’t worry too much about it). Make another 6.0 gallons (23 L) of 1.25X wort as before and add 3.0 gallons (11 L) of fresh, chilled wort to each fermenter, so that you have 6.0 gallons (23 L) of fermenting beer in each. Ferment at 68 °F (20 °C). After fermentation stops, let the beer settle for 2–3 days. When both batches have stopped fermenting, proceed to packaging. Sanitize three 5.0-gallon (19-L) Cornelius kegs. Boil roughly 3.25 gallons (12 L) of water down to 3.0 gallons (11 L) in 15 minutes. Cool as quickly as you can manage. Don’t splash the water around while cooling. If possible, bubble some CO2 through the water, once chilled. Open the first fermenter and rack 2.0 gallons of beer into each of the three Cornies. Open the second fermenter and rack 2.0 gallons of beer into each of the three Cornies. They should now each have 4.0 gallons (15 L) of of 1.25X beer apiece. Top off each keg to the 5.0-gallon (19-L) mark with the chilled, deaerated water. The kegs should now have 5.0 gallons (19 L) of 1X beer each. Purge the headspace with CO2 and carbonate the beer to 2.3 volumes of CO2. Sanitize a bottling bucket and seven cases of 12-oz. (355 mL) beer bottles, or 88 22-oz. (650-mL) bottles. Boil 4 qts. (4 L) of water down to 3 qts. (3 L) in 15 minutes. Add 3.8 oz. (110 g) of corn sugar in final 5 minutes. Cool quickly, and bubble CO2 through the cool sugar water, if you can. Quietly transfer the 3 qts. (3 L) of sugar water to the bottling bucket and rack 3.0 gallons (11 L) of 1.25X beer into it. Bottle this primed beer. Repeat three more times. This beer will remain in good shape for awhile (at least two months), but will likely start to go stale sooner than normal. This is because it’s impossible to completely deaerate water by boiling. Serve all the beer promptly, though, and you’ll be fine. Why, exactly , is it limited to a maximum O.G. of 1.052 for the full strength recipe? The concentrated wort would be 1.065. I usually aim higher than that. As the original gravity of a beer rises, so does the amount of esters produced by the yeast. In fact, ester production rises more than proportionally, such that a beer made via high-gravity brewing (post-fermentation dilution) is more ester-y than the same beer fermented at working strength. If your fermentation starts above 16 °Plato (roughly 1.064), it’s likely your resulting beer will be more ester-y than desired. This isn’t a sharp dividing line, however. The yeast strain as well as the desired level of esters in the beer can be factored in. For example, if you wanted to brew an old ale with a lot of esters, you could make some 22 °Plato (OG 1.088) wort, ferment it with an English ale strain, and dilute it to 17.5 °Plato (OG 1.070) after fermentation. Alternately, if you increased your pitching rate above optimal (which decreases ester production), you could ferment a stronger beer initially. However, in most cases, keeping the initial fermentation below 16 °Plato (~OG 1.064) will yield the best results. I think it’s a pretty good rule of thumb for brewers trying this for the first time, but not something that should hold experienced brewers back if they want to experiment.